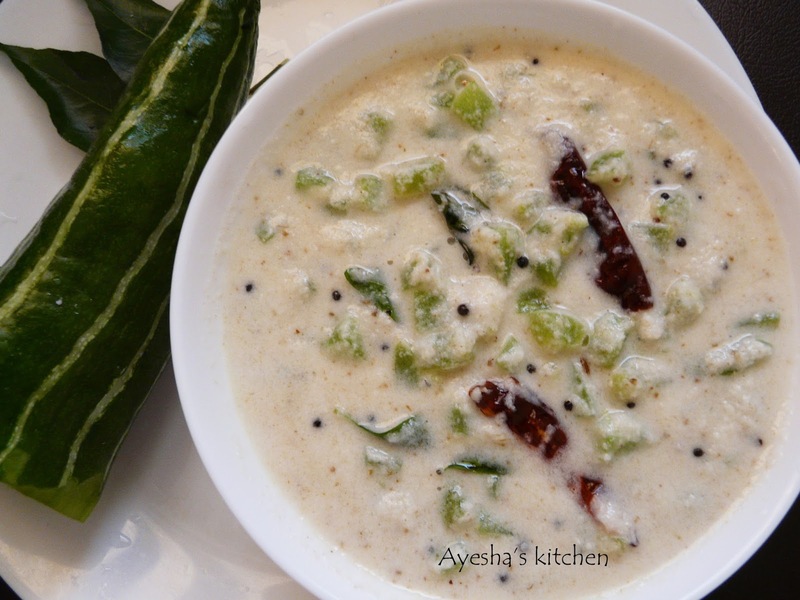 A simple and tasty side dish made with snake gourd that belongs to cucumber family. Snake gourd is a low calorie and fiber rich vegetable. The combination of sauteed snake gourd with coconut chutney and yogurt together makes a delicious side dish which can be served with rice or roti. In Kerala, Padavalanga pachadi is one of the popular and traditional dishes in Onam sadhya or Vishu sadya. 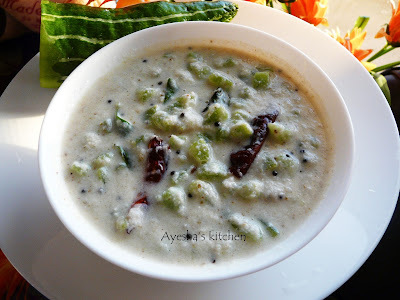 Pineapple pachadi, carrot pachadi, vendakka pachadi, beetroot pachadi are some of other dishes similar to padavalanga pachadi / snake gourd pachadi / snake gourd raita. So let's see how to make snake gourd pachadi / snake gourd yogurt chutney / padavalanga pachadi. Heat a pan and add 2 tbsp of oil. When hot, add finely chopped snake gourd along with salt and cook until it becomes tender. Do not over cook. Set aside. Crush together coconut, green chili and cumin seed with a little amount of water in a mixer to a fine paste .Transfer it to a bowl. Then add curd to the mixer and just grind the mixture for few seconds and mix it with the coconut paste. Combine well and now add the cooked snake gourd to it. Check for salt. Splutter dried red chilly, urad dal and mustard seed in a heated pan with 2 tsp of oil. Then add curry leaves to it. Pour it over the pachadi / raita.. Served as a side dish along with rice. Enjoy.